Who killed Anne Frank and where did she die? I thought that everyone in the world knew that Anne Frank died from an illness in the Bergen-Belsen camp and that everyone knew the approximate date that she died, but apparently I was wrong. Today’s entry to the canon of Absolutely No-Fail Ideas: a German train named after Anne Frank, who was executed by the Nazis along with her family after being crammed onto a cattle train to Auschwitz. Anne Frank was not executed by the Nazis. She was crammed onto a cattle train that took her to Auschwitz, but she did not die there. She died at Bergen-Belsen. Bergen-Belsen was the name of an infamous Nazi camp which has become a symbol of the Holocaust that claimed the lives of 6 million Jews in Europe more than sixty years ago. In 1943, Bergen-Belsen was initially set up as a detention camp (Aufenthaltslager) for prisoners who held foreign passports and were thus eligible to be traded for German citizens being held in Allied internment camps. In December 1944, Bergen-Belsen became a concentration camp under the command of Josef Kramer, the former Commandant of the Auschwitz II camp, also known as Birkenau. A section for sick prisoners, who could no longer work in the Nazi forced labor camps, was set aside at Bergen-Belsen in March 1944. In 1945, when World War II was drawing to a close, civilian prisoners were evacuated from other concentration camps as Soviet troops advanced westward; thousands of these prisoners were brought to the Bergen-Belsen camp which was not equipped to handle such a large number of people. Finally, Bergen-Belsen itself was right in the middle of the war zone where bombs were falling and Allied planes were strafing the Autobahn and the railroads. British and Germans troops were doing battle on the Lüneberg heath right outside the camp. In February 1945, the situation at Bergen-Belsen became catastrophic when a typhus epidemic broke out in the crowded camp. The photo below shows a British soldier shoving the bodies of Jews into a mass grave, after the Jews had died in a typhus epidemic at Bergen-Belsen. The news that train company Deutsche Bahn is planning to name a high-speed train after [Anne] Frank, along with 25 other “famous Germans,” according to the BBC, has been met with outcry from the groups charged with preserving Frank’s legacy. I see nothing wrong with naming a train after Anne Frank. Passengers on the train could be given a small booklet that tells the true story of how Anne Frank died. What is the meaning of the word Stolperstein, you ask. This is a German word which means “stumbling stone”; these stones are now being set on sidewalks all over Europe, not just in Germany. As you walk down a street in Europe now, you will have to look down at the sidewalk, so that you don’t stumble over a small plaque set among the stones in the sidewalk. Forget about looking at the buildings or anything else — you must think only about the Jews who were Holocausted. Don’t complain about this. Remember — it’s all about the Jews. Nothing else matters. People stayed home so that they could protect their house from being the target of tricks. When I was a child, the favorite trick that was done in the small town where I lived, was putting a large piece of farm machinery on top of a building where it would be very difficult to get it town. This was done during the dead of night. The building was on Main Street very close to the Catholic church where Catholics would see it the next morning on their way to Mass. In my town, instead of saying “better call Saul” the townspeople would say “better call Bill”. Bill was my father. Bill could neither read nor write, but he was very smart — he knew how to get a piece of farm equipment down from a roof without breaking the machinery or the roof. He would bring ropes and direct the men in the town in the art of bringing a tractor safely down. One year, my mother took me out in the cold, just after day break, so that I could watch as my father climbed up on the top of the building where there was a large piece of farm equipment, and then directed the safe removal of the machinery by several men in the town. Children’s clothes shop Gymboree has sparked outrage among Jewish customers with a dress for toddlers bearing a star reminiscent of the patch Jews were made to wear in Nazi Europe. The patch that was worn by Jews during the Holocaust was yellow. This patch is red, so what is the problem? The importance of this diary entry is that it shows that Anne was a good writer, and that she was an innocent child who tried to make the best of the situation. What is never mentioned in these news articles about Anne Frank is that her father was a convicted criminal who was engaged, at that time, in lying, cheating, and stealing. Otto Frank had tried to escape to America, along with his brother, but Otto was not allowed in because of his criminal record. His brother was also a criminal but he manged to lie about his criminal record and he got in. The point that I am making here is that Jews have a reputation for lying, cheating and stealing and that is why they have been hated the world over, since the beginning of time. Dear readers of my blog in Germany: Everything that I write on my blog is against the law in Germany. It is O.K. for American soldiers who are stationed in Germany to read my blog, because German laws do not apply to them. However, German citizens in Germany are in danger of going to prison if they are caught reading what I write. The Jews are back in Germany, and the Jews rule. So don’t go denying the Holocaust in Germany. Therefore, it comes as no surprise that in 1960 the first law against Holocaust denial was passed as a reaction to the re-emerging anti-Semitism in German society: On Christmas Eve 1959, just a couple of months after its widely celebrated re-opening, the synagogue in Cologne was besmeared with swastikas and anti-Semitic slurs by two members of a right-extremist party. In the following months an entire wave of anti-Semitic acts swept over Germany. The administration of chancellor Konrad Adenauer (CDU: Christian Democratic Union) saw itself under considerable pressure to act and therefore decided to pass a law against ‘incitement’ (Volksverhetzung). The purpose of this law was to, among other things, make the denial of Nazi crimes against Jews a crime. The mind-set of the deniers was seen as the foundational myth of new forms of anti-Semitism that focused on the state of Israel and its alleged moral blackmailing of the German state based on the – in the eyes of these anti-Semites – ‘historical lie’ of the Holocaust. Once passed however, the law was never really used to sentence Holocaust deniers as the judicial qualifications necessary for a conviction were set very high. Furthermore, the German judicial system was still full of officials who started their careers in the Third Reich and in most cases were not willing to really confront their, and their country’s past. That does not necessarily mean that they still held on to their old beliefs – even though that could be found too – but they were very reluctant to address the topic of Vergangenheitsbewältigung (the process of coming to terms with one’s past) and therefor bring charges against Holocaust deniers. Jew Lew Eisenberg was New York port authority commissioner in charge of Twin Towers 9-11, When State owned. Jews Larry Silverstein and Jew Frank Lowy bought 100 year lease on Twin Towers, destroyed 5 weeks later. Jews Silverstein & Lowy took out double terrorist attack insurance, paid out 5 billion upon destruction. Jew Larry Silverstein & daughter Stayed away from Twin Towers on 911, missing regular breakfast meetings. Israeli based Odigo messaging system warned 4000 Israelis working in and around Twin Towers/Pentagon. Only 4 Israelis died Jew Alex Diamandis vice president of Odigo confirmed to FBI that message was sent 2 hour prior to attack. Israeli firm ‘Zim shipping’ broke lease at WTC and moved out days before 911, paid large fine to do so. 5 Israelis, Silvan & Paul Kurzberg, Oded Ellner, Omar Marmari and Yaron Schmuel arrested on 911, (3 were ‘Dancing Israelis’). 2 suspects (Israelis) arrested near Washington bridge in van full of explosives, reported on US news. 5 Israelis arrested failed Polygraphs, later released and admitted on Israeli TV to being sent to NY to ‘Document’ the event. All worked for ‘Urban Moving Systems’. Jew Dominic Suter, owner of Urban Moving System fled to Israel after FBI visit. Building 7 was not hit but collapsed on 911. Collapse announced 20 minutes before event by BBC. Jew Larry Silverstein owned building 7. Larry Silverstein admitted, “we decided to Pull It”. (A Demolition term). Jew Michael Chertoff was assistant Attorney general in charge of the criminal investigation of 911, NOT ONE HELD !. Chertoff later became secretary of homeland security, ordered all Israelis set free. Chertoff oversaw the rapid destruction of evidence on 911. Zionist owned junkyards (2) cut up steel from TWC and shipped it to Asia. Israeli owned security firm ICTS ran CCTV cameras and security at all airports connected with 911. Jew Ehud Barak in London on 9-11, Benjamin Netanyahu in London on 7/7, was warned prior to bombings. Jew Philip Zelikow executive director of 911 commission report, total whitewash !. Jew Sheiler Birnbaum oversaw settlements with 96 families who refused to accept payments from Feinberg. Jew Elvin K Hellerstein, Federal Judge oversaw all 911 litigation. His son was defence lawyer for ITCS !. Jews Kroll & associates WTC security with Jew Maurice Greenberg AIG criminal. Jews designed and run the 911 memorial. Pre & Post 911, The US secret service uncovered the biggest Jewish spying ring in American history and Deported over 200 Israelis, some posing as art students. ‘AND THEY SAY ARABS DID 911 !’…. 9/11 was an attack on the buildings owned by one man, and only on the buildings owned by this one man. What are the chances that a foreign country would do something like that? 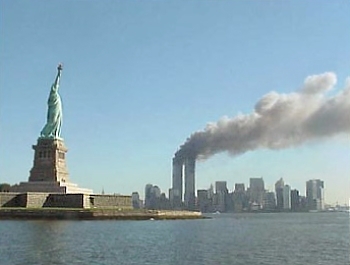 The anniversary of 9/11 has just passed, and there are stories about it in the press as I write this. Why would a foreign government attack only the buildings owned by one man? This is a great mystery that will probably never be solved. Why would a foreign government attack the buildings owned by a rich Jew, who could easily replace these building with newer, more spectacular buildings? Witold Pilecki was a Polish cavalry officer and a devout Catholic. He bears the distinction of being the only person who ever voluntarily sought to be captured and sent to the Nazi concentration camp at Auschwitz. Before World War II, Pilecki was happily married to schoolteacher Maria Pilecka (née Ostrowska) and the attentive father to their two children, Andrzej and Zofia, who are still alive. Pilecki cared deeply about the welfare of his community: he established an agricultural cooperative, helmed the local fire brigade and also served as chairman of a milk-processing plant. In 1932, he founded a cavalry training school. He had fought in the Polish-Soviet War of 1919–1921 and the 1920 Polish-Lithuanian War. A description of the standing cells in Block 11 can be found in the book entitled “Das Bunkerbuch des Blocks 11, im Nazi-Konzentrationslager Auschwitz,” written by Franciszek Brol, Gerard Wloch, and Jan Pilecki, Hefte von Auschwitz (prisoners from Auschwitz), which was published in 1959. On page 120 of this book is a “Plan of the Bunker of Block 11 redrawn after the original plan No. 1152 of March 16, 1942.” On this plan, the four Stehzellen in Cell 22 are marked out and numbered 1-4.